Avocados are delicious pear-shaped fruits that are great for salads and guacamole. If you eat this fruit often why not try planting it in a small garden pot and grow your own tree and save yourself time and money. Now while the avocado tree is a warm season plant and can be easily destroyed by cold and frost. You can now learn how to plant this tree in a small garden pot and have it in your home. First of all carefully remove the seed from the avocado fruit, avoid cutting it as you do so. Then you thoroughly wash it clean of the avocado fruit, you can soak it for a few minutes in water then gently scrub off the avocado fruit that may be on it but be careful not to peel off the brown skin of the seed while you scrub it. The avocado seed is usually oblong in shape, although there are instances where it is almost a perfect sphere. However, every avocado seed has a top where the plant will sprout from and a bottom from which its root will grow. You will know this by observing the seed; the end that is slightly pointy is the top while the end that is slightly flat is the bottom. It is this bottom end that will be placed in water and not the top end, so take note before piercing with toothpicks. Next you will stick toothpicks at the bottom end of your seed; the purpose of this is to elevate the seed so that its entire body is not submerged in water. 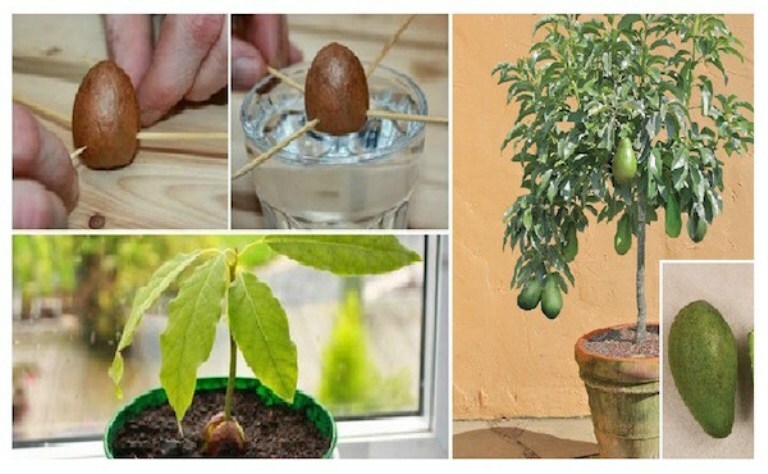 You should ensure that the bottom end of your avocado seed in placed in water to allow the roots grow. Make sure the toothpicks are firmly wedged in at an angle that slightly points downwards, this is to ensure that the bottom of the seed is properly submerged in the water when it is placed over a glass. You will notice the top end of the avocado seed will split and out of it will come a stem sprout, while its roots will grow out from its bottom end; this occurs in about three to six weeks. As soon as the stem is about five or six inches in length, you should just cut off the first set of leaves. By the next two or three weeks a fresh set of leaves will sprout out and also more roots will grow out at its base. As soon as the sprout tail reaches about 6 or 7 inches, you will need to trim it to half its length in order to promote fresh growth. Get a large flower pot and place in it an enriched potting soil. The flower pot can be about 8″ to 10″ across. Ensure that the soil is filled to approximately an inch from the top of your pot. Then you are expected to create a small hole at the center of the soil and gently place your seed by its bottom end into the hole. You should moisten your soil with lots of water afterwards and when you have done that you are done.